I told you we were in Chicago for a while….but this is the last blog for now. We have more trips planned this summer so there will be more soon….but hopefully we can get back to more Michigan things after this. On Monday, J and I went to the new chicken place to get sandwiches for dinner. They were closed for a staff meeting. We were bummed but ended up going to Buona instead. That didn’t mean we were giving up though. We went right back for lunch on Tuesday. 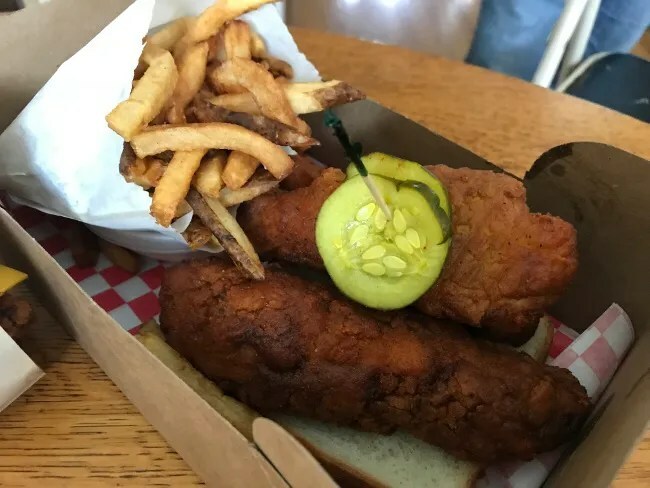 Fry The Coop bills itself as Nashville Hot Chicken. 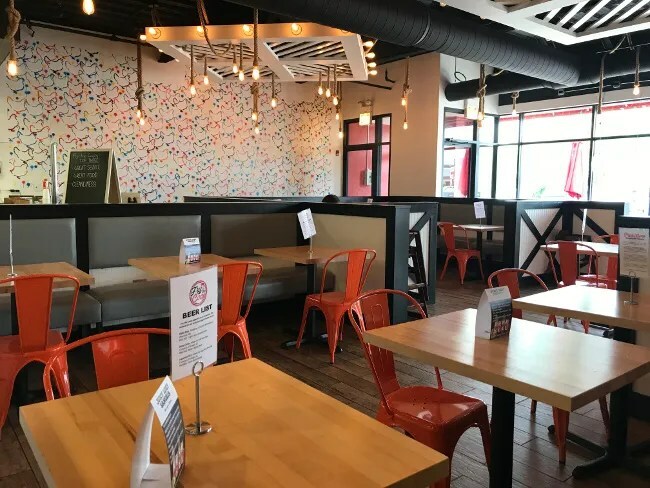 The restaurant is in a strip mall near the railroad tracks on 95th Street at 51st Avenue in what can be considered downtown Oak Lawn. The restaurant location is well known to me because it used to be an Al’s Beef. Between Al’s and Fry The Coop, the place was another chicken restaurant called Brooster’s. We never ate at that one and I don’t even remember it being there so not sure how long they lasted. This being a former chicken joint is important. 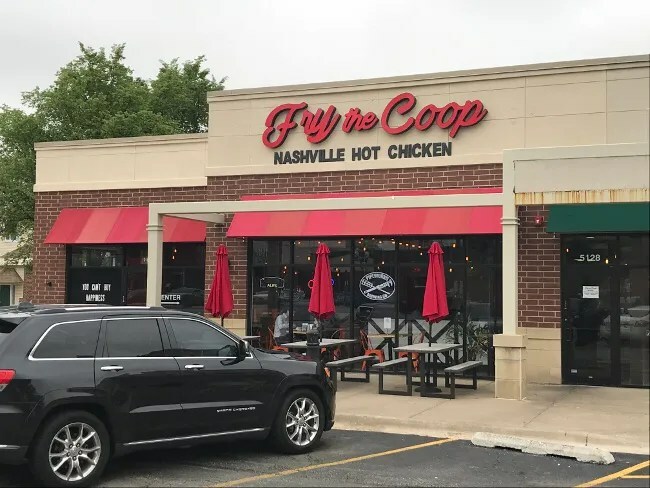 It’s the reason that Fry The Coop is a chicken joint. The Daily Southtown did an interview with the owner. 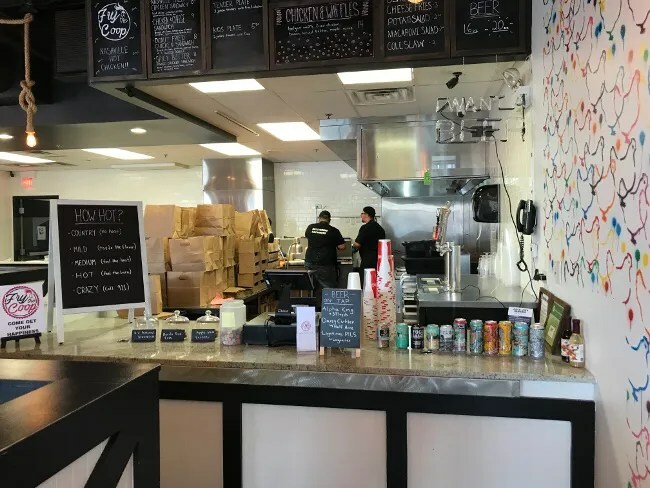 His plan for a restaurant was meatballs, not chicken…but this is such a great space and it just seemed like a chicken restaurant, so he went with it. The set up of the restaurant is pretty much what I remember from the Al’s Beef days. You walk in to an order counter that turns into an L-Shaped kitchen. 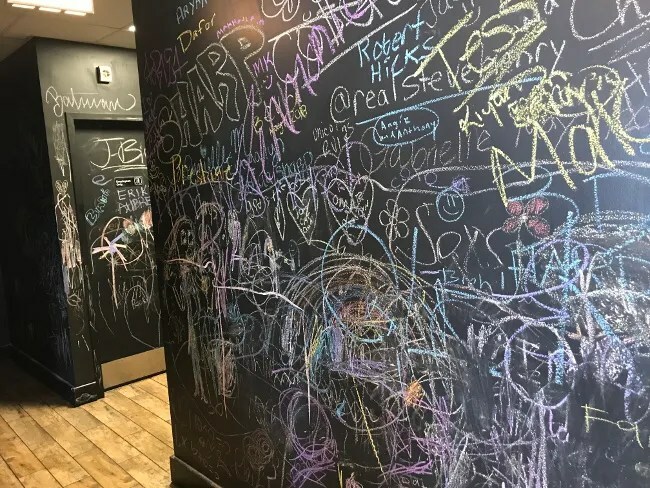 The menu board is written in chalk and hangs above the cash register. Behind the guy taking the order is the deep fryers and beer taps. The layout of the dining room also looks familiar although there has been a lot of redecorating done from the Al’s days. The walls are white and covered with colorful outlines of chickens and the walls have been given black trims pieces that remind you of a barn. It’s a bright, cheery space with exposed hanging light bulbs and a ceiling that lets the duct work become part of the decor. I had a pretty big order and I was working from memory instead of being smart and writing it down. I was getting sandwiches for myself, J, and her parents while also getting chicken strips for the kids. My biggest issue was not knowing how spicy to get everything. There’s a handy little guide on the counter next to the register. 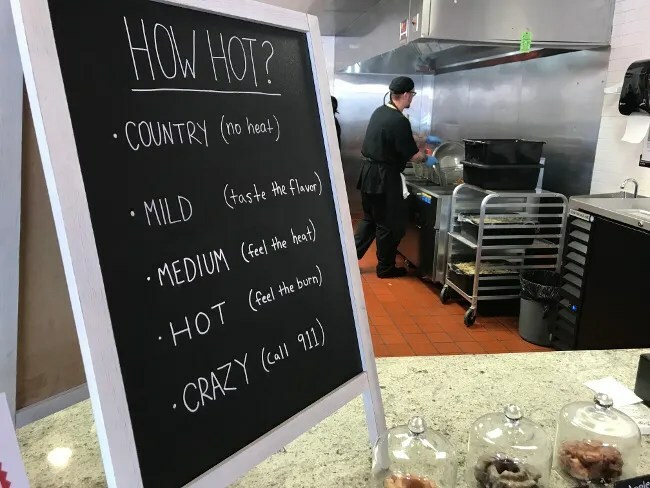 I always think you have to have at least a little heat…I mean, it is a Hot Chicken place. My order was the easiest for me to figure out because it was for me. I did the Nashville Fried Chicken Sandwich. I ordered it medium and then started to change it to hot but the guy taking the order said if I hesitated I should probably stick with medium, so I did. 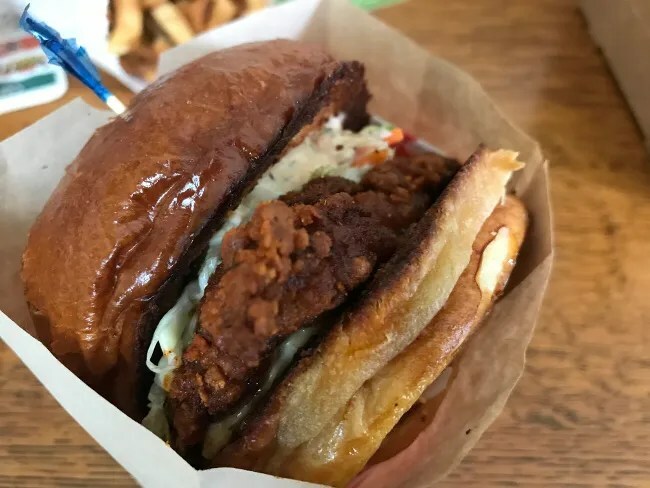 The sandwich is a deliciously crispy yet flavorful fried chicken sandwich with coleslaw, pickles, and special sauce on a brioche bun. The chicken was so good. It’s like comparing a McDonalds cheeseburger to a gourmet burger shack cheeseburger if you replace McDonalds with Chick-Fil-A and burger shack with chicken sandwich shack. The difference is amazing. The thick, juicy chicken breast has an amazing breading that is fried perfectly golden brown without overcooking the meat inside. The sauce adds a little bit of heat to the already spicy chicken while the slaw sort of cools it all down. The pickles get a little lost in the slaw on this sandwich but they’re delicious home made pickles that were tasty on their own. My in-laws and J did the Chicken & Cheese Sandwich. 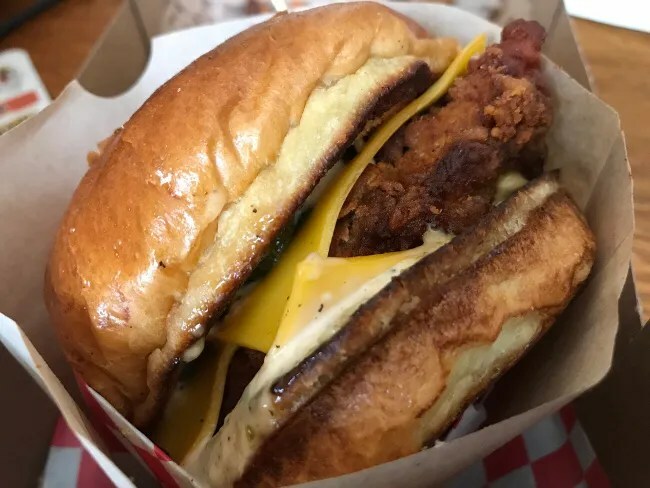 In this case, the fried chicken was topped with American cheese, pickles, and special sauce on a brioche bun. Again, perfectly cooked chicken that I did mild on the spice. All three of them said it was a little spicy but we think it was coming from the sauce and not the chicken. I got the kids an order of the Kid’s Tenders and I got an order for the Tender Plate which just kind of became a table share. Both orders came with fries but the Kid’s plate comes with two tenders while the Tender Plate comes with three. Again, large, crispy, juicy pieces of meat made up the tenders. I got the kid’s tenders “Country” which is no heat and the Tender plate medium. Even after eating my own sandwich, I had a hard time not eating all of the left over tenders that were still on the table. I added on fries to my order and got an extra order for L since she and B were sharing a the kid’s tenders and they both would likely end up eating mostly fries. 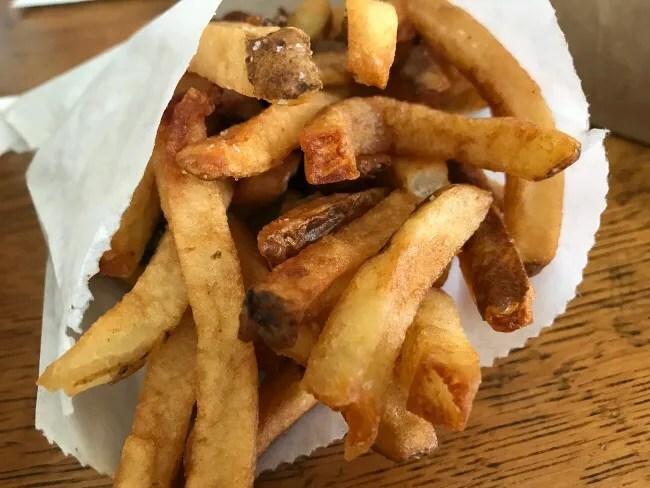 The fries are delicious, hand cut potatoes that are a little crispy yet still a little soggy. J’s mom wasn’t a huge fan because she thought they were under seasoned. I enjoyed them because I like this kind of skin-on fry that is kind a crispy yet still light and fluffy in the middle. I also got J an order of fries but she did the seasoned fries instead. These are the same fries as the regular ones but with a little seasoning salt. There was a little bit of heat to them but not a whole lot. Don’t tell her, but I ate a few of these on the way home and replaced them with my fries. 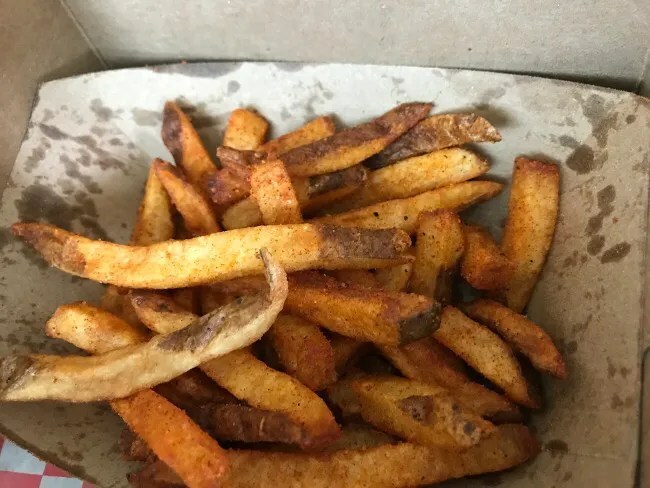 I tried to rub the regular fries with the seasoned ones to pass the seasoning around. 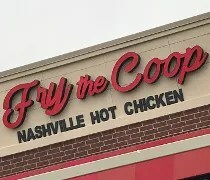 Fry The Coop is some of the best chicken I’ve ever had. It’s by far the best chicken sandwich I’ve ever put in my mouth. The whole meal cost a little over $50 but we had a lot of food. In the week since we left Oak Lawn, both J and I have talked many times about going right back to this place on our next visit home.